The most recognizable rugs from the 1920s and 1930s are Chinese Rugs made by Walter Nichols. These Nichols rugs, as they came to be known, were primarily made during the Art Deco movement in the early 20th Century. They were usually made of wool and silk and depicted floral designs in very rich, bold colours like magenta, turquoise, emerald, canary and ruby. They either had a very thick border or none at all. Nichols specialized in a mechanized wool spinning technique that produced a very thick strand - ideal for rugs. He was inspired by the works of many Art Deco artists and began to incorporate some classic deco motifs into his designs. Nichols rugs became wildly popular in the Art Deco era - they were luxurious and exotic - the epitome of Art Deco style. 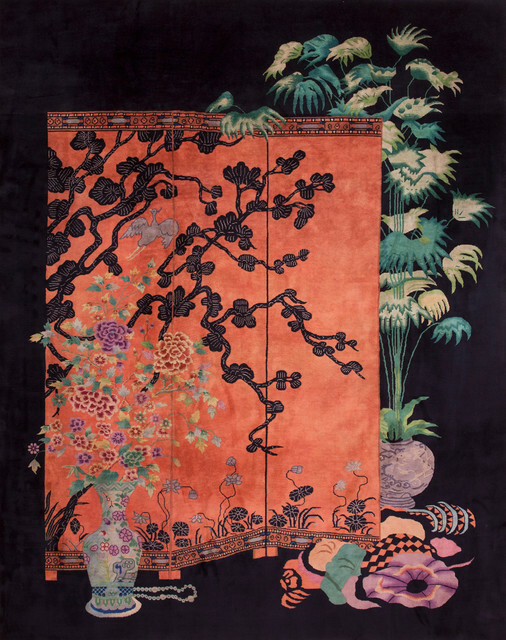 To learn more about Walter Nichols Chinese Art Deco rugs, visit Rahmanan Rugs. Authentic Art Deco rugs are highly coveted due to their extreme rarity. Even though Deco inspired rugs are readily available at many modernist retailers and suppliers, a vintage Art Deco rug made in the 1920's or 1930's is hard to come by. They are available for viewing in some museums and art galleries, however purchasing one for your own home may be a bit more difficult. You can scour the online auctions like Ebay or look in antique stores to find an Art Deco rug. Some online antique stores, like 1stdibs.com, may also have a small collection of Art Deco area rugs and carpets available. If you can't get the real deal, look for a rug inspired by the Art Deco style. Most rug retailers will carry pieces that contain some Deco elements. Look for the same Art Deco rug characteristics as I mentioned above - geometric patterns, bold colours and luxurious feel. I personally prefer the authentic Art Deco rugs as opposed to the revival - the new style is somewhat lacking in character. However, I do like the revival pieces when they are made as an homage to Art Deco, as opposed to trying to 'knock-off' an original piece. Artistic inspiration can come from anywhere and often artists cannot help but interject elements of their favourite artistic style into their pieces. Nevertheless, copying something identically with the intention of passing it off as the real deal, lacks integrity it in my opinion. So my advice would be to look for Art Deco rugs that contain a few elements or characteristics of the style, rather than a tacky replica.